Casio has launched a wearable-lens camera for photo enthusiasts looking for a new angle on selfies. 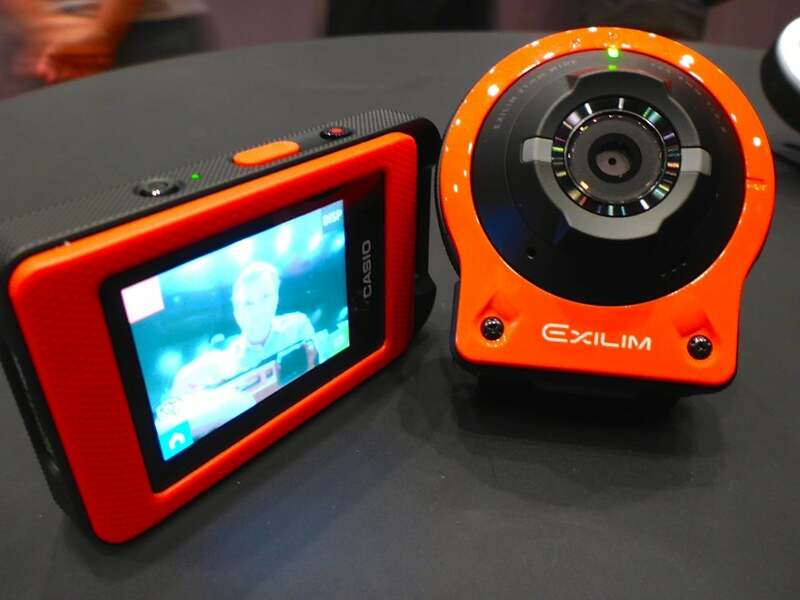 The Exilim EX-FR10 consists of a round lens unit and a rectangular body with an LCD screen that can be detached with the press of a button. 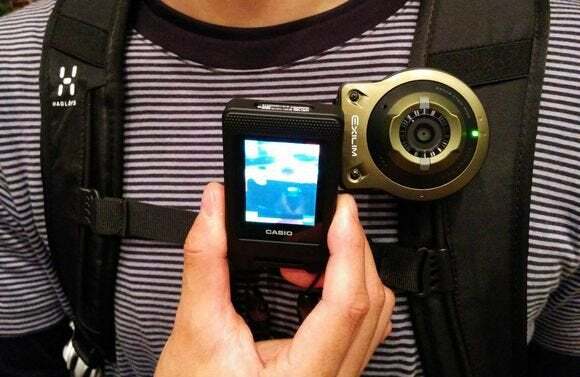 The lens, which has all the camera functions, can be strapped onto your wrist, helmet, backpack or handlebars as a wearable device, as well as attached to remote objects like trees for group shots that are triggered by Bluetooth commands. The FR10 is similar to the GoPro camera system, which also has an optional LCD screen, but is aimed at everyday users and families instead of sports buffs. It’s also easier to undock from the screen unit and attach to clothing or other objects in the environment. The combined units have a solid, smartphone-like feel when they’re put together, which gives them a total weight of about 175 grams. There’s a 14-megapixel sensor in the Wi-Fi-equipped lens unit, which weighs about 63 grams including memory card but excluding the hinge attachment. The hinge can be replaced with a strap to wear the lens. The 80-gram controller unit has a 2-inch LCD touchscreen display. It can take some time for your mind to get around the concept of shooting with a detachable lens, especially when holding the lens in one hand and the screen in the other. The shutter release can be triggered either by a button on the lens, a button on the screen unit or by touching the screen itself. One of the best uses of the camera, of course, is pointing the lens at yourself for selfies, though it doesn’t swivel like Sony’s recently announced Cyber-shot DSC-KW11, which resembles a perfume bottle. The 2-inch display is definitely on the small side, with the menu items somewhat tricky to navigate if you’re used to a 5-inch smartphone screen. But it’s an acceptable sacrifice if you want to wear your camera or attach it to your dog’s collar, for instance, instead of holding it all the time. 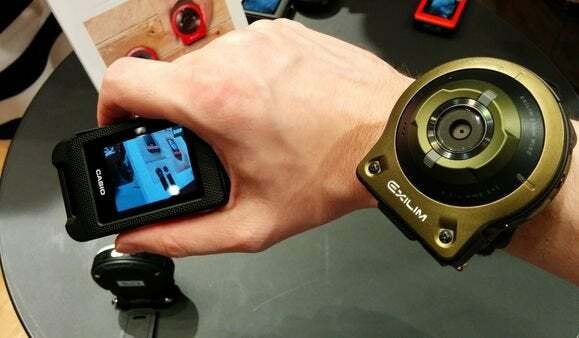 The splash- and dust-proof camera is also shock-proof for drops of up to 2 meters, according to Casio. A handy function for both photos and videos is the Highlight Photo/Movie function, which automatically selects the best shots based on variables such as the clarity of faces and puts them in a collage that can be shared with friends. When you do detach the lens unit, however, the hinge has a fairly long metal plate that’s not the most comfortable thing to hold. It’s designed to be big and tough enough to ensure a secure docking with the display unit, and is a useful stand for the lens, but makes for slightly awkward handling when the hinge component is still attached to the lens unit. Battery life is also limited at 255 shots per charge or about an hour when recording a movie in full HD at 30 frames per second. The other potential turn-off is that the lens unit is fairly large and bulky at 6 centimeters across and nearly 3 cm deep. On a wrist, it looks like a very chunky watch. Casio, however, is hoping the suggested retail price of about ¥50,000 ($491) won’t put off potential users when it launches in Japan in September. The company also plans to market the FR10, which will be available in orange, green or white, in China and elsewhere in Asia before deciding on a launch in the U.S. and Europe.